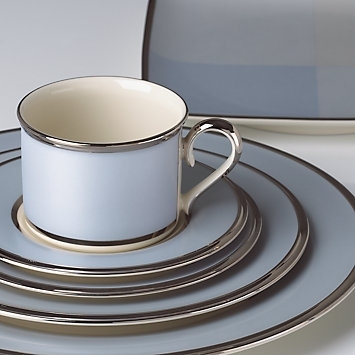 Contemporary in style, the Blue Frost 5-pc Place Setting combines traditional ivory fine china with a smoky blue border. The rim of the dinnerware shimmers in precious platinum for a cool, classic accent to any table setting. Diameter of dinner plate: 10 1/2", salad plate: 8", bread plate: 6 1/4", saucer: 6", capacity of teacup: 6 oz.